My Home It’s On Fire | My Home - It's on Fire! Russound CAV6.6 – It’s on fire! A long time ago, when I was young, I remember imported electronics that were first introduced here were not thought very highly of. I also remember someone joking that the reason the UL sticker was wrapped around the power cord, was that it was the only part they tested. The quality and performance of consumer electronics has improved in ways hard to imagine decades ago. You might also think we would have progressed in terms of safety and labeling standards for consumer electronics. I certainly did until just recently. . . . . I came home from work and my wife said she and our daughter were going shopping for a few hours. She also told me my son was not feeling well and was sleeping in the basement. I figured that it would be a great time to retire to the upstairs back bedroom for a nap. I closed the door and put the fan on high to isolate me from our sometimes noisy neighborhood and quickly fell asleep. After my wife left she realized she had forgotten her discount coupons and returned home to retrieve them. Upon entering the house she heard what sounded like firecracker explosions coming from our basement. As she approached the basement stairway, she could already see the smoke coming up from downstairs. I awoke to her screams as she saw the burning unit and tried to awaken our son Ryan, who was sleeping about 20 feet from the fire. She had to carry him outside because he did not wake up right away. As I opened the bedroom door I could see a smoke layer hanging in the air on the second floor. As I entered the basement, it was dark with smoke, although the burning Russound CAV6.6 was easy to spot with the flames visible through the vents in the cabinet. Rather than run for a fire extinguisher first, I pulled out all the connecting cables from the unit. 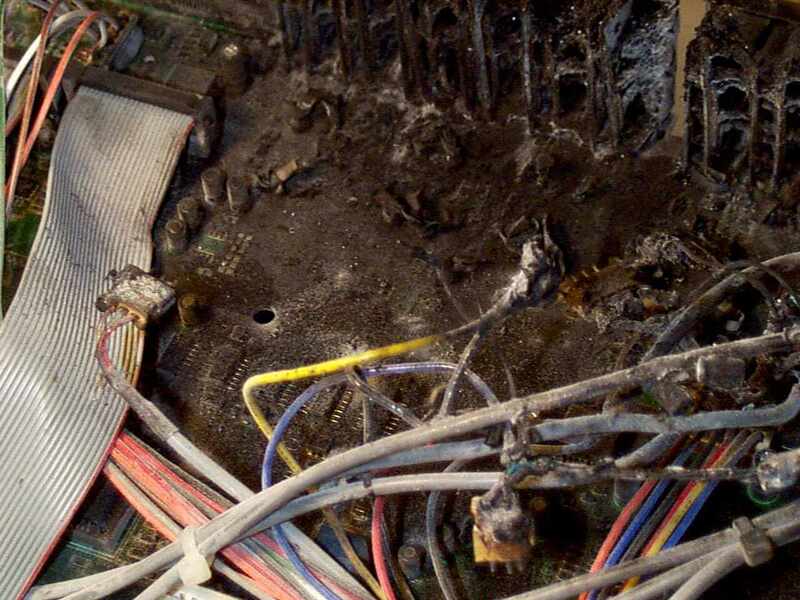 Flames shot out the back of the unit as more capacitors exploded and as I yanked the cables free. From my electronics experience I believed that removing power from the Russound CAV unit would extinguish the fire within seconds. (Faster than I could retrieve the fire extinguisher) The reason I believed this was that since the 1970’s, all televisions in the United States have been “self extinguishing” once the source of the fire was removed. I ran for a fire extinguisher anyhow “just in case” and when I got back downstairs the fire and smoke was worse. Rather than ruin all my equipment and possibly destroy evidence needed to determine why this fire happened, I found a cool enough part of the cabinet and grabbed the CAV unit and took it outside. The fire continued to burn after I had tossed the Russound CAV in the fire pit so I filled it with contents of the fire extinguisher. The whole sequence of events took place in just a couple minutes. The Fire in The Russound Is Out! First there was a feeling of joy knowing the family and pets were out of the house and the fire was extinguished. Then a cold empty feeling started to sink in. We wondered how this could have happened and how close we came to losing our house or maybe even our lives. Although there was no burn damage to the house, the smoke smell was so severe I sent the family out to a movie, shopping and dinner while I opened every door and window to clear the smoke. After I got the house opened up, I wondered what I should do next. I did not need to call the fire department because the fire was out. I did not need to call my insurance company because I knew what started the fire and who should pay for the cleanup. I bagged up the Russound CAV6.6 and inspected the surrounding wires and installation. I made a mental note that I did not even think the unit was turned on. Later that evening I was so ill from the smoke (carbon monoxide and poisonous gases) I called a friend who is a fire investigator and his wife a nurse to ask if I should check myself into the hospital. We decided if I got any worse I should probably go, but I was probably through the worst of it. We left the house totally open for two full days with the air conditioner on high. We considered checking into a motel, but worried about leaving the house “open” while we were away or closing it up and retaining the smell. The children suffered from both the smell of the house and their allergies. Our noses, throats and eyes burned for several days along with severe headaches. It took several thorough scrubbings, every window washed and six weeks to rid our new house totally of the smell. Russound never even offered to pay to clean up my house or even replace my fire extinguisher. The Problems With Russound Are Just Beginning! Little did I know that my adventure with Russound and my CAV6.6 was just beginning. . . . starting with a phone call to Russound first thing Monday morning. My whole house audio system consisted of a Russound CAV6.6 with 6 primary zones controlled by six UNO-S2 and six secondary Russound A-Bus zones utilizing a Russound AH-4 four port Russound A-Bus hub, an auxiliary 24 volt power supply A-PS, and a Russound ACT-1 remote power outlet. The speakers were Russound and RBH and included Russound Outback OB-6.1 outdoor speakers.